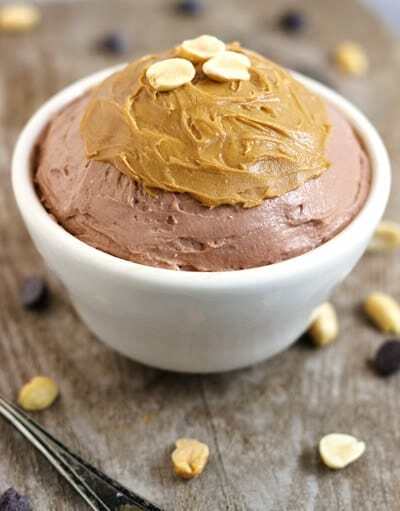 A quick and easy high protein recipe that tastes like chocolate peanut butter cheesecake, that is healthy enough to eat everyday! This is the only recipe that I have EVER posted that I eat every.single.day.of.my.life. Actually I lied. I go between this and the other high protein snack: healthy almond joy cheesecake every.single.day.of.my.life. I am not exaggerating at all (for once) when I say that I actually get really sad if, for some reason, I can’t end my day with this. I know it doesn’t look like much, but don’t judge a book by its cover guys. Listen to your moms. I really don’t know what to call it, so I have affectionately named it “cheesecake.” But,unlike the healthy cottage cheese cheesecake, it is not not actually cheesecake, but it really and truly does taste like it. I have even non health-obsessed friends agree with me. I like when this happens. It means I have not gone totally bananas. Plus, it keeps your taste buds happy. So so so happy beyond words. My favorite flavour combo is peanut butter/chocolate. Give me something peanut buttery and chocolatey and I will show you a magic trick. It’s called I-will-inhale-it-so-fast-you-dont-know-how-I-didn’t-choke-and-die. Probably the lamest trick you’ve ever seen, but it’s all I got. This little bowl of yum has got that rich, creamy and thickness that I usually only find in a true cheesecake. But, this is made with cottage cheese. And protein power. And natural peanut butter. Healthy healthy healthy! Then we can all be food twinsies and that would be, like, sooooooo kyoote. You can devour it right away, but it's the best if you let it get even firmer in the freezer! Mine takes about 1 hour, but check every 30 minutes to make sure it hasn't gone rock solid! * I like to use casein protein over whey protein, as it is thicker. However, whey protein will be just as yummy! 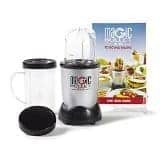 *I usually use 1 Tbsp of peanut butter in the actual mixture, and if I am feeling extra generous with myself, I will add an additional 1 Tbsp on top just before eating! Want more uses for protein powder? I just made these and put them in the fridge for the kids breakfast tomorrow morning. Really good! I only used about a half a teaspoon of trivia since I don’t like using much artificial sweetener, but it is really good! I really don’t eat as healthy as I should, but this actually sounds good! I would have to use regular sugar instead, I’m anti artificial sweeteners, but otherwise I’m trying it! I promise you’ll love it…I just ate it myself! I made this a couple of times last week – it is SO filling. I was wondering if you have a casein protein powder you could recommend? All I could find at the store was whey so that is what I used. I have to place an online order for some other things so – thought I would ask what you use/recommend! 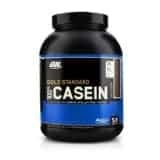 An here is the casein that I use and LOVE! http://www.bodybuilding.com/store/opt/cas.html I use the Chocolate Supreme One…I have tried Chocolate Cake Batter and Chocolate PB…not so good! Thanks so much! Yes, I saw the Almond Joy one first I think. 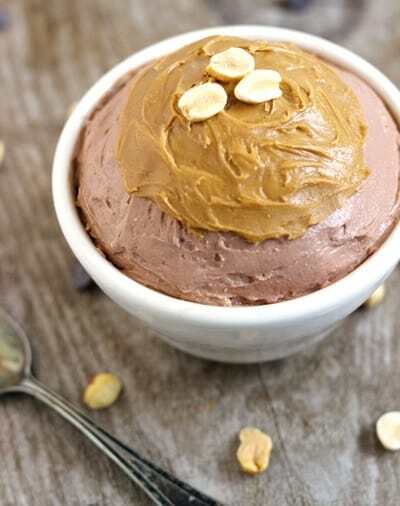 I actually made this version but with almond butter…so kind of a mash up of the two recipes? I really want to try it with the peanut butter next. Sounds like a great mash up to me! 🙂 I am so happy you like it…can’t wait to eat mine tonight! I think this is one of your recipes that more people NEED to try! Correct me if I am wrong but it seems like you could make several in advance so they are always ready in the freezer. I can’t wait to try the protein powder you recommended…such great reviews online! I forgot but I stuck a couple of chocolate chips on top of mine one night because I am cray-zee like that…it really took it over the top in richness! Yes you could! I have frozen them too long before (so they were rocks) but then just microwaved them a few seconds! However, I have only frozen for max 2 hours, but I’m sure you could do days – great idea! I hope you love it, please let me know if you do! 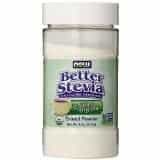 It’s also great just mixed with stevia (or whatever sweetener) and a bit of water. It’s way thicker than Whey, so it goes like a pudding! YUM! I NEED CHOCOLATE CHIPS ON MINE. Love it! I would freak out too, but we really shouldnt! Don’t worry about comments, I love them! I have used vanilla whey, which tasted good but I LOVE the casein thickness, I just don’t have vanilla casein, but that would be DIVINE!!! Yum! I actually put that over top of roasted kabocha squash. Sounds weird, but delicious! 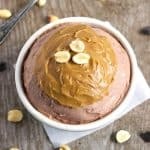 So, I’ve been on a lo-carb diet for almost 3 months, currently down 20lbs and was just thinking about trying to make a peanut butter cheesecake when I found this recipe, Its in the freezer, can’t wait to try it! YAY! I hope that you LOVE it..please let me know! Hi. What kind of casein powder do you use? I have not tried it with Pb2, but I love the stuff so I bet it’s delish! I am so glad you loved it, it’s still my nightly addiction! Thank you Niloo! 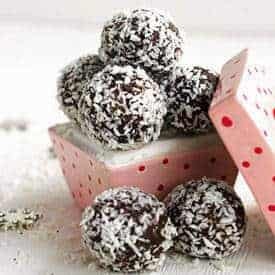 I’m a newbie to this low carb way, no sugar way of life..Don’t know anything about protein powders and is it an esstential ingredient in this recipe or can I do without it? What exactly are you wanting to know about protein powder? Unfortunately, it is essential to getting the thick “Cheesecakey” texture of this. You COULD try cocoa powder, but it would be quite bitter and I can’t guarantee it works, as I only make it with protein. But protein powder is low carb and naturally sweetened 🙂 I hope that helps! I see I’ll have to do some looking into these protein powders as they appear to be in many of the desert recipes I am now looking at..If at some point I decide to make this Peanut butter cheesecake I’ll let you know how I do..Thanks for your reply..
Well I’ll have to go to the local Vitamin store and speak to someone there about which chocolate protein powder would be suitable for me..Like I had said this low carb and supplement taking is a whole new way of life for me..Thanks again..
Of course! 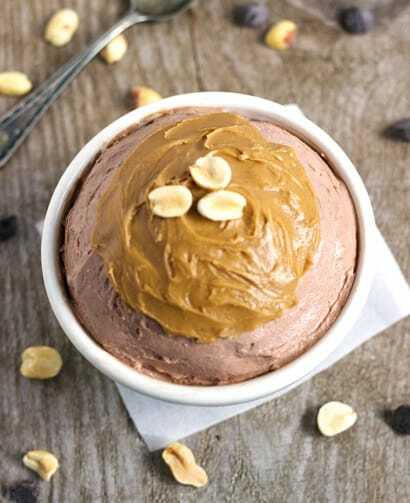 If you need a suggestion, I make this with Optimum Nutrition’s Chocolate Casein..it’s low carb, sugar free and DELISH! Let me know if you try it! 😀 I just put mine in the freezer! 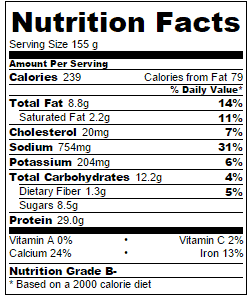 Do you have the nutrition facts on this recipe by any chance? Can you taste the cottage cheese?? I’m not a fan and new to low carb. Not helpful that I’m such a picky eater. Not at ALL. 🙂 It just tastes like creamy chocolate and peanut butter goodness. I know MANY people who love this recipe!